As a social marketer, a great way to connect with your community is to collaborate on boards. Pinterest lets pinners participate in group boards, where like-minded people add pins around a common theme. For example, crafters can contribute to a board featuring current projects, or LEGO enthusiasts can pin their latest creations. Exposure: You’re marketing your brand, and others are doing the same. Having pins on a collaborative board means more exposure. Moreover, some of the pins you’re sharing will lead to your blogs and websites. Grow community: If you consistently posts intriguing pins, others will want to see more of your Pinterest pins and boards. Group boards are a terrific community building tool. Camaraderie: Some pinners just enjoy planning boards around a theme in the spirit of fun collaboration. Click the Add+ button located in the top-right corner of any Pinterest page. Enter the board name and category. Beneath those two options is the Who Can Pin? question. Your image appears next to it, and beneath that is a blank text box. 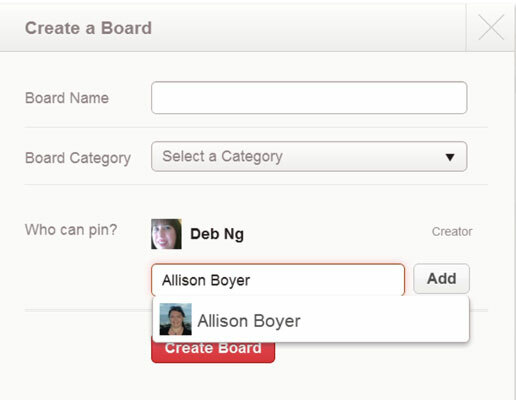 In the text box, start typing the name of a pinner you want to invite to your group board. Here’s the first catch: The person has to be a member of Pinterest for you to invite her. And here’s the second catch: You also have to be following the person before you can invite her to your group board. As you type, potential matches appear in a list below the text box. When you see your invitee listed, select the person’s name and then click the Add button. The person is added to a list below the Add button. Repeat Steps 4 and 5 to add all the people you want to invite to the group board. After the group board is created, those who are invited to collaborate receive a notification and can begin pinning immediately. Invite people you trust. Instead of inviting random pinners you don’t know, invite friends. Be sure group pinners have your best interests at heart and won’t spam the boards. Invite people who are knowledgeable about the topic. When you plan a board, choose people who know the subject matter. If you don’t, your board will be a mish mash of items instead of a visually, informative resource. Establish clear guidelines. You want to establish some guidelines for pinning to your group board so there’s no inappropriate content. This information can be provided in an e-mail— either a heads up that an invite is on the way or, better, a request asking whether it’s okay to send the invite — that you send in advance. Stay on topic. If the board is meant to share the architecture of New York City and someone pins an image of the St. Louis’s Gateway Arch, you’ll probably want to alert the pinner to remove it unless it’s germane to the discussion. You can’t remove pins or pinners. As of this writing, anything someone else posts to your group board is there permanently unless the pinner decides to remove the pin or removes herself from the group board. Even as the group board’s owner, you don’t have the ability to moderate pins.